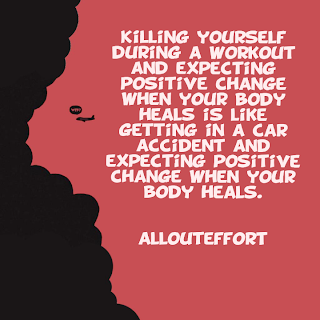 Killing yourself during a workout and expecting positive change when your body heals is like getting in a car accident and expecting positive change when your body heals. Trauma doesn't stimulate good change. 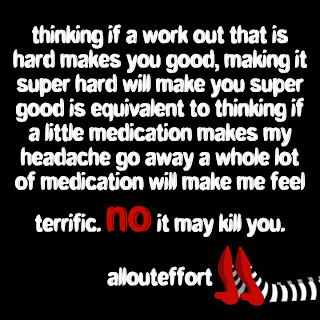 It's like thinking if a difficult work out makes me better, a super hard work out will make me super human. 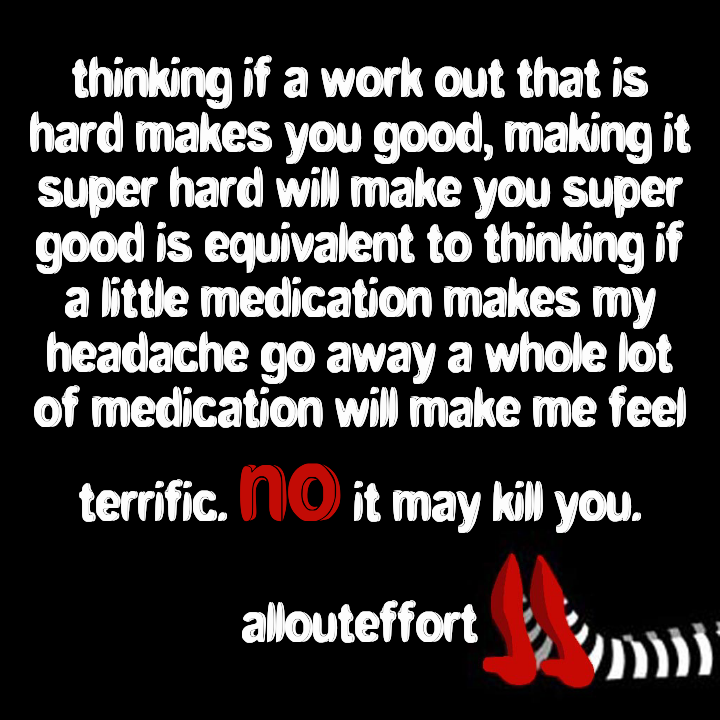 That's equivalent to thinking if a little bit of medication is good for my headache, then taking a whole lot of medication at once will do wonders for my headache. Some people have an unhealthy relationship with exercise. The goal of exercise is improvement, not punishment. Some people somehow got it stuck in their head that only when they are punished, admonished, beaten, or battered will they become better off for it. That there is nobility in it, they are the martyr victim. Leave that kind of thinking at the therapist's office. The gym and your training program is not your therapy. Go there to heal and improve not to let your issues run wild. It's why a lot of people who hate exercise say they enjoy yoga or pilates or hiking or jogging. 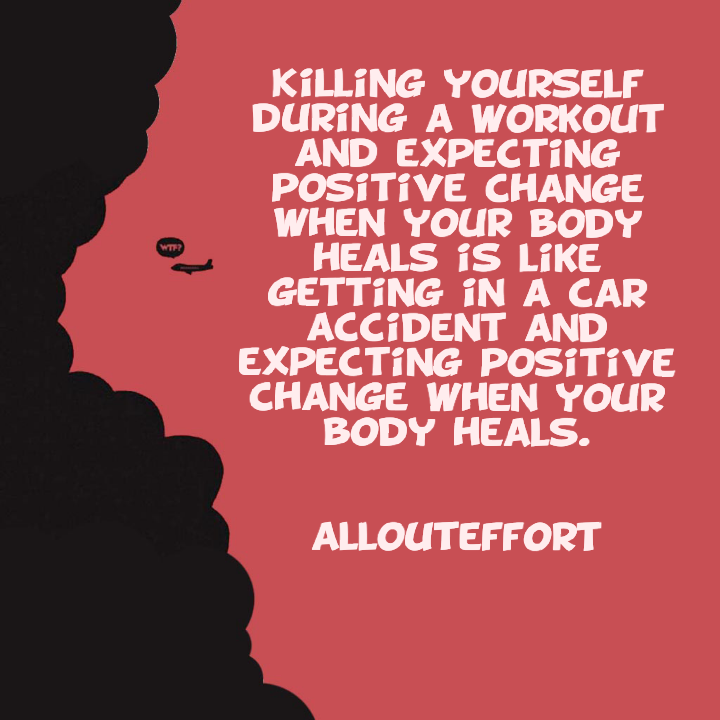 They enjoy physical activity but they assume exercise is this painful and destructive thing that it's not. It's why people hate the gym, it's not the activity they hate, its the environment and the culture that has established itself around it. Remember the goal of exercise is to improve you, leave all the rest of that BS at the door.